You may have noticed that instead of a church altar front-and-center, we have a fireplace—its hearth made from Texas limestone. This architectural detail goes back to the very founding of Covenant, when a member shared his vision of a welcoming church that was also a retreat center, modeled after the ethos of the Great Hall at Laity Lodge retreat center near Leakey, Texas. 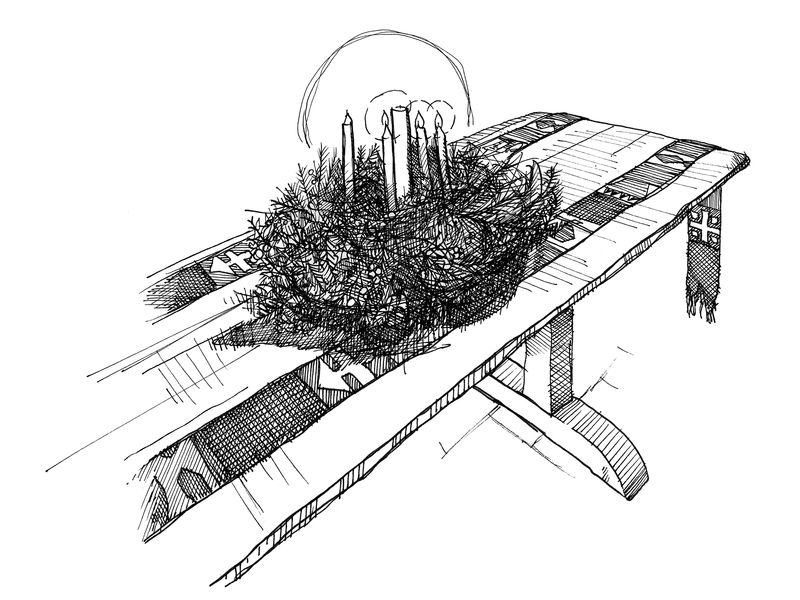 At the very center of our worship space is our altar-table, handmade by Fredericksburg, TX artist Robert Feuge, a friend of several Covenant-folk. In addition to the table, we’re told that Feuge sourced the wood our mantle-beam above the fireplace from a historic 1850s Amish barn in Ohio. On the table, you will notice a Christ candle in the center (or an Advent wreath in December), flanked by two Guatemalan clerical stoles. These were “…hand-woven by indigenous Tz’utujil artisans of Panabaj Santiago along Lake Atitlán in Guatemala. Fifteen artisans have been perfecting their liturgical stoles on treadle foot looms since 1970 when a Catholic priest, Stanley Rother, encouraged them to weave stoles as a source of income. Father Rother, or Padre Aplás as he was affectionately known, dearly loved the Tz’utujil people and was moved by the extreme poverty in which they lived. He sought a form of sustainable income for the Tz’utujil people that would lift them out of poverty. Rother believed there was a market for clerical stoles handcrafted by the master Mayan weavers. “[These] artisans are paid a fair wage for their work and also benefit from scholarships for their daughters and microcredit loans to expand their businesses. The money earned from weaving stoles has allowed Tz’utujil artisans to support their families and participate in the economic development of their communities.